For the sake of argument, let’s say you wake up one day in the London Borough of Ealing and you are supposed to make a day of it here. Go. Why are you still here? Oh, you don’t know where to start. Well, if you are this bad at organising, maybe you should leave others to do the plans for you before you decide to wake up in Ealing. Fine, here’s a sample. Start the day with a good breakfast. You will probably find none better in this area than what is on offer in the Magnolia Cafe – a Polish cafe for all the British people and visitors to enjoy. A true gift from the thriving Polish community in Ealing. After breakfast it’s time to lose some weight. And what better way to do that than taking a trip about the shopping districts and lighten up the load in your wallet? With the stock on offer at Southall Broadway you will definitely find more than one reason to do it. If you still have some food left in you, you can walk it off in a tranquil and wonderful green open space. Walpole Park gives you just that, with its untouched for almost 200 years, almost wild, setting with three ponds. And it even has a big manor to look at. After you return to civilization, you might feel a bit artsy. 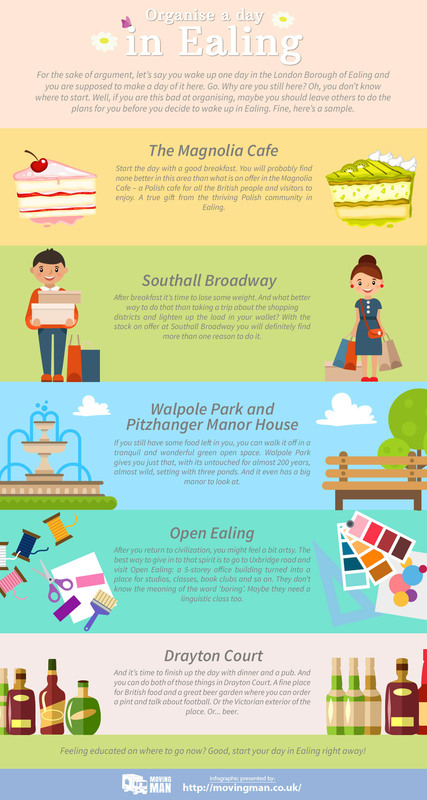 The best way to give in to that spirit is to go to Uxbridge road and visit Open Ealing: a 5-storey office building turned into a place for studios, classes, book clubs and so on. They don’t know the meaning of the word ‘boring’. Maybe they need a linguistic class too. And it’s time to finish up the day with dinner and a pub. And you can do both of those things in Drayton Court. A fine place for British food and a great beer garden where you can order a pint and talk about football. Or the Victorian exterior of the place. Or... beer. Feeling educated on where to go now? Good, start your day in Ealing right away!